SoftExpert Risk covers all aspects of the risk management process, from initial risk identification, through risk assessment and evaluation to risk mitigation and monitoring, managing incidents, and ensuring appropriate follow-up and integrated reporting. The software fits into all and any organizational field, which means risk management automatically takes place in the company projects, processes and strategies; product development; environmental, health and safety; governance practices; IT management; and others. 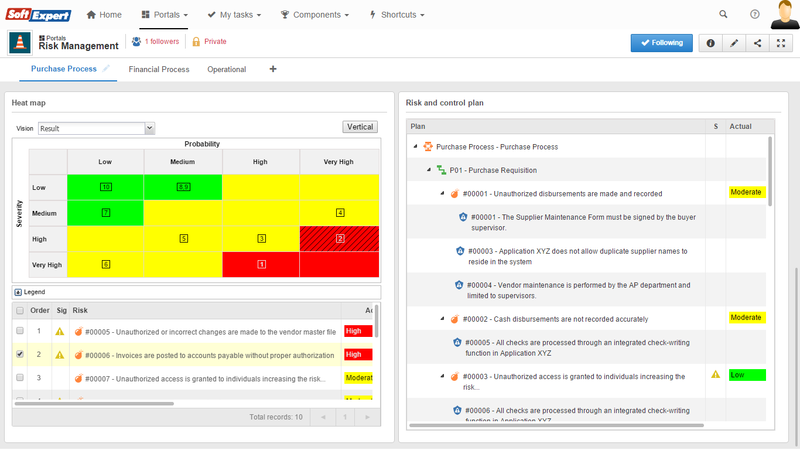 The SoftExpert risk management solution supports the end-to-end risk management process in a solid design and integration with other GRC (Governance, Risk and Compliance) functions including regulatory compliance and internal audit, ensuring that organizations can cost-effectively establish a wide risk management function. 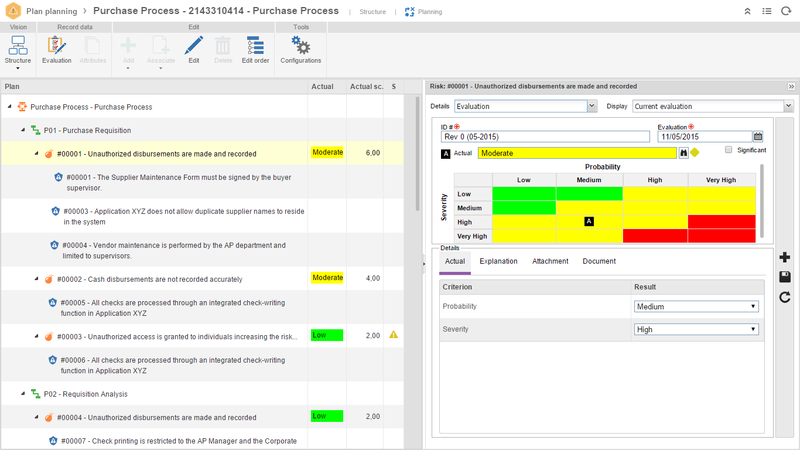 SoftExpert Risk includes key features such as visual representations of the risk framework, customizable evaluation methodologies, workflow enabled processing of risk assessments and control tests, and enterprise level visibility and reporting. It is important to say that the requirements, concepts, and methods applied in the system completely meet all demands set in the main standards and worldwide methodologies, such as ISO 31000 and COSO framework. Establish a risk infrastructure that consistently delivers high-quality data, produces accurate regulatory reports, and enables real-time risk management and monitoring. Create repositories of risks, controls, mitigation activities and standard operating procedures facilitating reuse. Identify, capture and manage the most critical risk and compliance processes with a solution that provides auditability and traceability. Measure exposure and risk across all risk types and update measures as often as needed. Assess risks against various risk dimensions using configurable impact and likelihood scales and powerful workflows to ensure correct data gathering. Ensure superior quantitative and qualitative model risk management, regardless of model type. Provide automatic risk assessment based on information collected in relation to the frequency and impact of events that occur. 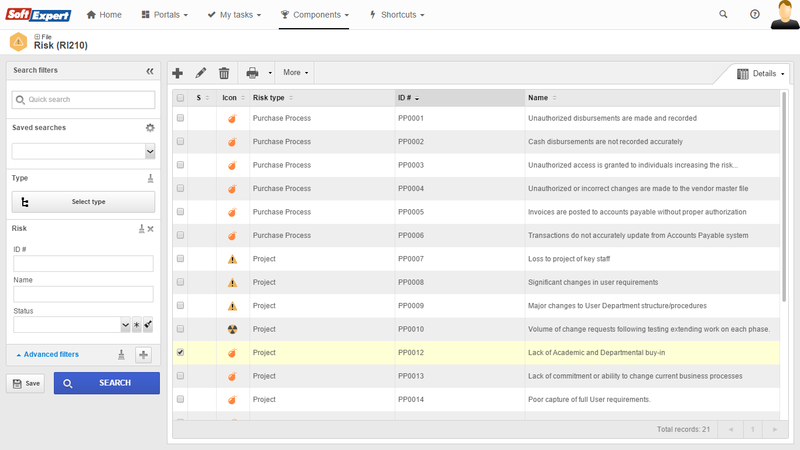 Provide measures and comparisons of inherent and residual risk, with proactive alerts when key thresholds are exceeded. Offer decision tree structures for identifying critical control points. Automate control testing cycles and provide instant notifications of significant issues in the control environment. 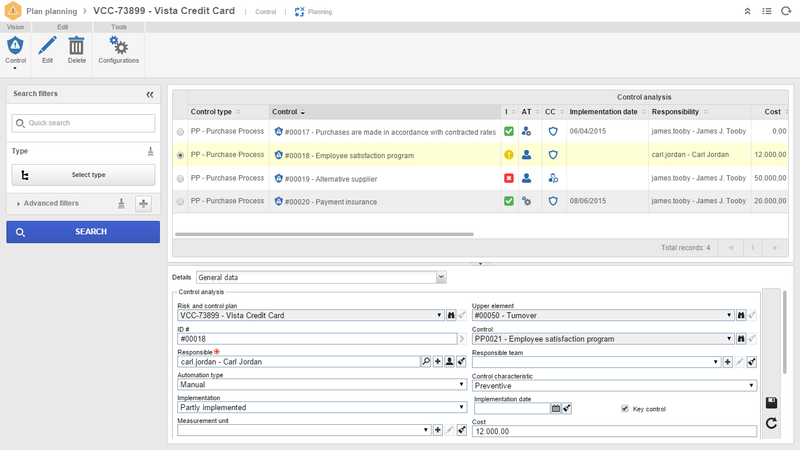 Initialize events (Incidents, Problems or Workflows) automatically, according to the risk or control assessment results and using fully configurable rules. Monitor the effectiveness of mitigation activities, controls, and policies as well as changes in risks and requirements through testing, business metrics, and robust incident management capabilities. Enable risk calculators and risk heat maps for risk analysis and monitoring. Provide a global view of all risk-related activities through an executive dashboard. Report using configurable reports and portals with drill down heat maps, risk trends, top risks with risk overviews and all relevant details. Use different dimensions of risks, like financial, reputational, legal, safety, health, environmental and food safety.